With new gas stations sprouting up in Erie, it's time to talk design. Today, Erie drivers can pull in to a Country Fair to "Drink Up, Chow Down and Fuel Up." At any Giant Eagle GetGo folks can "Get In, Get Out and Get Going." Thanks to the "Kicked Up Convenience" of a new Sheetz on Peninsula Drive, motorists will be able to buy gas right next to Presque Isle's gateway. Yes, Erie needs gas stations – but their aggressive, suburban designs must be tamed. Urban critic Dhiru A. Thadani notes that gas stations demonstrate "little regard for pedestrians" by locating the "garage, cashier, and store in a structure at the rear of the property." Unfortunately, given the loss of Sanders Market and other downtown grocery stores, car-less residents are often left to shop for food at gas stations. City gas stations should be "walkable." Thadani reports that the majority of U.S. stations "are located on corner properties" where they "have the greatest negative impact." Thankfully, Thadani offers a solution: Leave the existing gas station in place and "insert a corner building." Galina Tachieva's Sprawl Repair Manual provides a diagram outlining this kind of improvement. We need gas stations, but the ones we have are, simply put, unattractive. Does this matter? Yes. Prime Minister Winston Churchill believed Britain's people would be diminished if the grand buildings damaged in WWII were not reconstructed. He claimed "we shape our buildings; thereafter they shape us." More recently, Duncan Stroik, a University of Notre Dame Professor of Architecture, commented that people are negatively impacted by "mechanistic facades" that do not "elevate the spirit." Clearly, people behave differently in a wide-open baseball stadium, in a stately courtroom, and in a chapel with stained glass windows. This is because we are all being shaped by architecture and our built environment. Since a recent (controversial) experiment documented that even fleeting Facebook posts can be orchestrated to direct our moods, shouldn't we be taking more care with the built environment that surrounds us 24/7? The Victoria Transport Policy Institute (VTPI) reports that the built environment or "public realm" can "feel safe and inviting" or dangerous and unwelcoming. When places feel safe and inviting, people will walk. And, when people walk, traffic is reduced, public health is improved, the economy is strengthened, and numbers of "residents and visitors" increase. The design of our built environment – gas stations included - will determine Erie's future. Gas stations can have style. The Art Deco Dunkle's Gulf, built in 1933, still stands in Bedford, Pa. Matt Shaw's essay, "Get Pumped: Eight Filling Stations Fueled By Great Design" features examples from Los Angeles to Tel Aviv, including the Slovakian chain, GAS. Featuring white concrete columns merging with a canopy outlined in orange neon, GAS is gorgeous. According to the StartUpBiz site, gas stations are designed for visibility. They try to have a station at every major intersection and use bright lighting and "tall signs" to attract customers with their "familiar brand logo." Street setbacks provide speedy entrances and exits from each traffic direction. Familiar layouts comfort regular shoppers and maximize profits. But these dollars leave the community and diminish long-term neighborhood stability by creating a noisy corner lot with non-stop, transient traffic. Let's imagine that instead of building the "world's largest GetGo" on the vacant lot at West 12th Street, Lincoln Avenue, and the Bayfront, Giant Eagle decided to bring the world-class architecture of GAS to Erie. Unlikely. But it is crucial to ask for something better than the usual corporate construction. Ed McMahon, who spoke at the Preservation Erie Awards in May, said that developers "evaluate locations based on their economic potential. When developers are asked to address local design, historic preservation, site planning, or architectural concerns, they will usually do so." Due to public pressure (and legal action) McDonald's has modified their franchise design dozens of times. They've built successful restaurants inside a historic building and another in a riverboat. A leading development consultant, Bob Gibbs, said that chain developers usually have several design options "ranging from Any-where, USA to Unique (sensitive to local character)." Gibbs says that "which one gets built depends heavily upon how much push-back the company gets from local residents and officials about design and its importance." Can Erie's leaders urge Giant Eagle to hire a New Urbanist design firm (for instance, Duany Plater-Zyberk) to design a GetGo complex that is "sensitive" to our Bayfront? Will our leaders ensure that pedestrians from the south and north (off Lincoln Avenue) and the East (Landmark Square Apartments and Boulevard Park) will have tree-lined sidewalks and bike paths connecting the city? Giant Eagle will be lauded if they stop their plans to install a huge "sprawl" development" at the city's "main entrance." 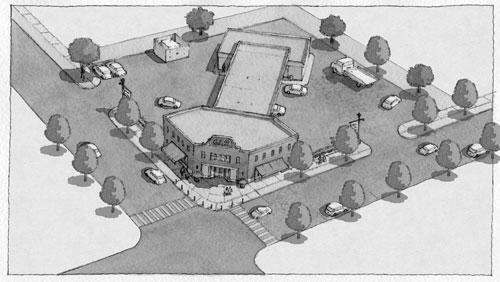 Thadani suggested that new gas stations be guided by legislation requiring that, "(1) the convenience store be placed on the front property line … (2) fuel dispensers be located toward the rear of the site… and (3) the architectural character of the building be compatible with the context, or the visual impact of the station be kept to a minimum." It's time that we advocate for legislation embracing Thadani's suggestions. And yes, you can help Erie's built environment. Stop by the "Preservation Happy Hour" at 5:30 p.m. Thursday, July 24 at the Plymouth Tavern to find out more. Civitas members can be reached at their website www.civitaserie.com, via Facebook at CivitasErie, by emailing Lisa@civitaserie.com, or by scheduling a Friday morning meeting at the Civitas office in the Masonic Building, 32 W. Eighth Street.